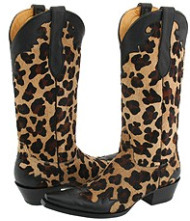 Dress to impress by adding these stunning Old Gringo Leopard print boots to your wardrobe and be ready to be the center of attention! Leather and leopard print pony hair upper. Beige/black color. Every Old Gringo boot goes through one hundred-ten individual steps, performed by skilled craftsman. This is a very time-intensive process, but the consistent application of these skills is required to make a superior quality boot. Old Gringo produces and tans their own leathers in colors, textures and finishes to meet the meticulous demands of their designers. After carefully selecting the finest grade of leather, the leathers undergo a detailed tanning process. Each of the next steps, from cutting the upper materials to assembling the insoles and outsoles are critical in the construction of the perfect boot.